Is NOVAK DJOKOVIC the GOAT of Tennis? NOTE: We are only discussing the greatest MALE tennis player of all time. The FEMALE GOAT is between Marina, Steffi Graf, Serena. And Steffi wins it as she is the only female player in open era to win a calendar grand slam. And yes before anyone points out, she also won the Olympic gold, but thats not a prize money event, so am not taking that into criteria for GOAT, which am basing on pure professional prize money events. Novak Djokovic wins the 2016 FRENCH OPEN and with it completes non-calendar GRAND SLAM or the Djoker Slam. Is Djokovic GOAT? Now, in my view, the most basic qualification criteria for GOAT or GREATEST TENNIS PLAYER OF ALL TIME is to win a Major or slam in all 3 surfaces. That automatically (and unfortunately) rules Rod Laver out as he won only on grass and clay. It is arguable if he would have won had majors been played on hard courts in 60s. The great Jimmy Connors! Yes, while he didn’t win French Open, not many know that his US Open triumph in 1976 came when it was played on clay. YES.. for 3 years, the US Open was played on clay as the hardcourt stadium was being renovated. And he beat BORG in that clay court US Open final. Borg as we know was a clay master! Connors obviously also won US Open on hard court and Wimbledon on grass. The sportive Wilander we know didnt win Wimbledon, but he did manage to win the Australian Open in 1983 and 84 when it was played on grass. He has also won the French Open on clay and the US Open on hard court. And then come the modern greats – Agassi, Federer, Nadal and now Djokovic – have all completed a “career grand slam” (all 4 majors played in 3 surfaces). Out of these 6 players, Novak Djokovic is the ONLY PLAYER to win 4 CONSECUTIVE MAJORS in a row across 3 surfaces. This makes Djokovic a massive GOAT contender. But despite that, Nadal remains, the only male player to win 3 consecutive MAJORS IN 3 DIFFERENT SURFACES within a single calendar year when he won the French Open, Wimbledon and the US Open in 2010. No player has ever done this to date. And Federer of course has 17 majors. But his poor losing record to Nadal in head to head really puts a dampener on his GOAT claims. BUT if Djokovic wins WIMBLEDON, then he will equal Nadal’s under-rated record above and also become the first to win 5 majors in a row. UNPRECEDENTED. And if he wins the US Open, then he wins the “calendar grand slam”, the ONLY male player to do it across 3 surfaces. And also winning 6 majors in a row in that process. Djokovic has ticked almost all other boxes: better head to head against the top 4 best players of his era: Federer, Nadal, Murray and Wawrinka and barring one, ALL his Major wins he faced another major winner as opponent. Plus, he has won more ATP Masters Series titles than anyone else.. and is also the first to cross $100MN prize money. Just Wimbledon and US Open wins this year stand between Djokovic and the crown of UNDISPUTED Greatest Of All Time (GOAT). In no generation or decade in the Open Era have the top active players won 91% of all grand slams! Not even the Wilander, Lendl, Edberg and Becker period. Have taken a top player to mean anyone who has AT LEAST won 4 grand slams in the Open Era in their entire career! Agassi, Courier and Sampras together won LESS THAN 60% of all grand slams. Borg, Connors, Vilas and McEnroe were better and they CUMULATIVELY won 75% of all slams. The immediate next group of Connors, McEnroe, Wilander won just 83% of their slams. Even the highly competitive 80s era of Wilander, Lendl, Becker and Edberg together won just 82% of all slams. But FEDERER, NADAL AND DJOKOVIC HAVE WON 32 OF THE LAST 35 SLAMS. Never before have the top tennis players DOMINATED a decade like this. This is a phenomenal 91% win rate in all grand slams. And the best part? the TIME PERIOD of this era is now 9 YEARS!!! so its not like a brief 2-3 year bright period. Its freaking 9 YEARS!!! (Click on the image to see full size). India become World Champions in Cricket after 28 years! 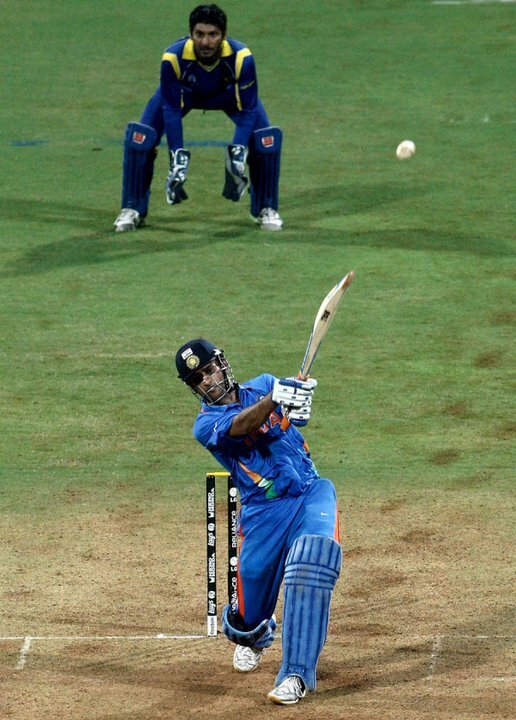 The shot that will remain etched in the memory of the 70 Million Live TV viewers in India on 2nd April 2011. Every Indian cricket fan would want to watch the India-Australia, India-Pak & the Final vs SL again and again! I searched around and found that the official highlights are already available! Check it out at Flipkart: ICC Cricket World Cup 2011 – Official Highlights. Full credit not just to the current Indian team led by M.S.Dhoni but to Ganguly, Dravid, Laxman and Kumble who laid the winning foundation for the current team by consistently winning test matches home and away. UPDATE: Dec6 2009: INDIA is now the NO. 1 Ranked Test Team basis official ICC rankings! This phenomenal achiement came when India defeated Sri Lanka in the recently concluded Test in Mumbai. 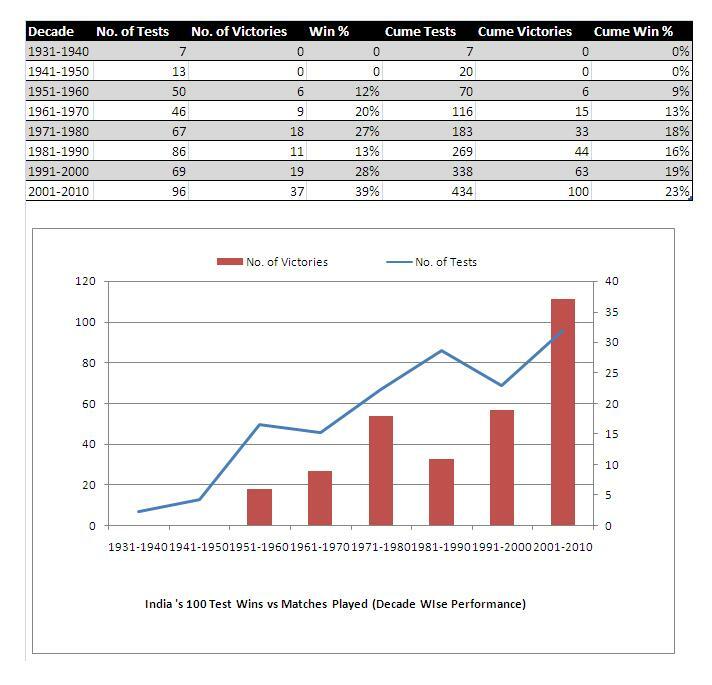 Have a look at India’s decade wise Test match performances, and we can easily understand that India’s win rate is increasing every 10 year years. More importantly, the more tests we play, the more we win. This chart also probably highlights how Indian team selection over the last few years has improved. The more merit involved in team selection, the better the results. More than anything else, this coincides with the entry and rise of the Big 5 batting superstars: Sachin Tendulkar, Rahul Dravid, VVS Laxman, Virender Sehwag and Saurav Ganguly. India’s bowling strengths were Anil Kumble, Harbhajan Singh and Zaheer Khan. The youngsters, Ishant Sharma and Sreesanth will hopefully carry the pace bowling torch forward. In terms of captaincy, India’s winning streak started with Azharuddin in a series of Home Wins… and Saurav Ganguly started India’s Overseas Wins. Dravid/Kumble maintained the win rate for their brief stints. The new captain, M.S. Dhoni has taken over from the previous generation and consolidated the win percentage. Why Nadal’s 5-2 head-to-head record against Federer is misleading! A lot of arm-chair Nadal fanboys keep touting the stat that in Grand Slam Finals, Nadal has a 5-2 head to head record against Federer and hence Federer hasn’t “dominated” Rafa. Nadal didn’t even make ONE U.S. Open final during Federer’s reign!!! ZILCH. ZERO. Not ONE SINGLE final in the 5 YEARS Federer won. Why should we bother about Federer losing to Nadal, if we don’t scrutinize Nadal losing to weak players in US and Aus Opens? In fact, Nadal lost to way lower ranked Soderling in 4th round of his FAVOURITE surface after winning 4 times. Federer has lost ONLY in the finals of Wimbledon since his 1st win in 2003 and NEVER lost US Open after he first won it in 2004. Considering Roger’s awesome hardcourt Slam record, the head to head would easily be in FEDERER’s favour of at least 8-5 (4 US Open wins and 2 Aus Open wins in Federer’s prime). By refusing to acknowledge Nadal’s miserable hard court slam record, and refusing to see Federer’s total dominance in US Open, the head -to-head stat supporters are PUNISHING Federer for his CONSISTENCY in reaching FINALS of ALL slams, and REWARDING Nadal for his failure in U.S.Open and Aus Open. Absolutely ridiculous. Basically Nadal fanboys have been devastated by Federer’s French open win and the fact that he has been declared the Greatest Tennis Player of ALL Time by none other than Sampras, Agassi, Lendl, McEnroe etc etc. The right way to check slam dominance, is to take up ALL THE SLAMS in which BOTH Nadal and Federer participated and check the winning percentage you find that Nadal is way inferior to Federer than Agassi was to Sampras (and not otherwise as Nadal fanboys love to believe). 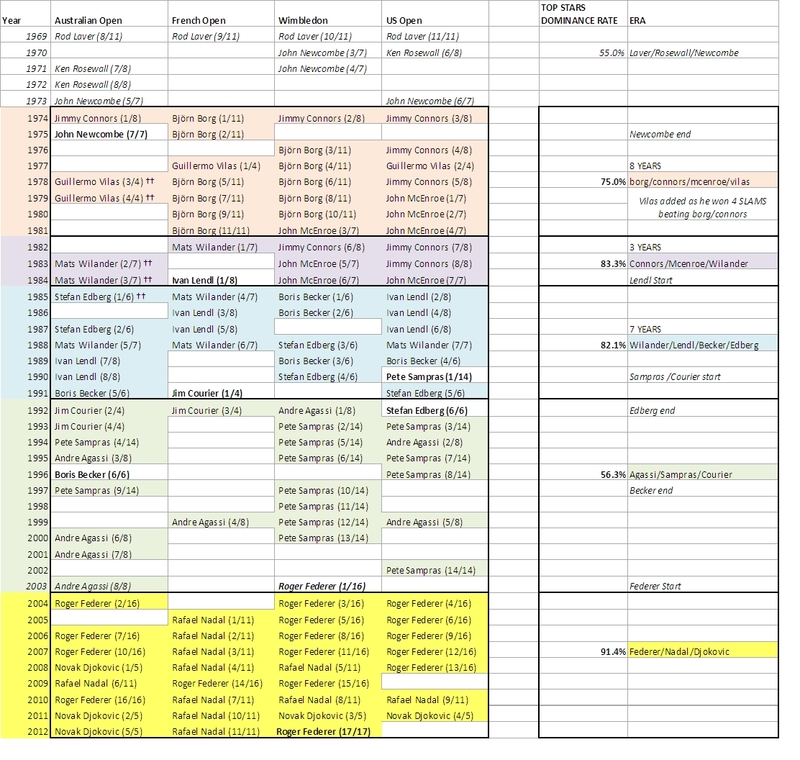 When you add the 2 Wimbledons, 4 Aus Opens and 5 US Opens that Nadal and Federer haven’t met in, but Federer won 2 , 3 & 5 of those Slams respectively, you get the TRUE picture. “You see his titles, you see my titles. There’s no comparison. Despite Federer’s more tightly-packed trophy cabinet, Nadal has a 14-7 head-to-head record against his rival and has won six of their last seven encounters. The 24-year-old Mallorca man, however, believes that is indicative of nothing more than the Spaniard’s famed ability on clay. “I am number two in the world for five years now,” he said. How can I get my CIBIL credit score online for free? Leonardo Da Vinci’s “Salvator Mundi” – the world’s most expensive painting? Want a good job? Get rich friends. The Balkans Chronicles on Is NOVAK DJOKOVIC the GOAT of Tennis? Rick on Is NOVAK DJOKOVIC the GOAT of Tennis? Escape to the countryside – Buzz Archive | Bournemouth University on What does “Reem” mean?